- Publisher George Eldon Ladd presents a practical and devotional scriptural study of the many aspects of the kingdom, based on the parables, the Sermon on the Mount, and other key passages. - Publisher Ladd, whose work has included much technical study of the doctrine of the kingdom, here presents a practical and devotional scriptural study of the many aspects of the kingdom, based on the parables, the Sermon on the Mount, and other key passages. 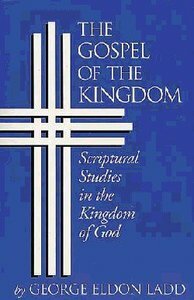 About "The Gospel of the Kingdom"
George Eldon Ladd presents a practical and devotional scriptural study of the many aspects of the kingdom, based on the parables, the Sermon on the Mount, and other key passages. Ladd, whose work has included much technical study of the doctrine of the kingdom, here presents a practical and devotional scriptural study of the many aspects of the kingdom, based on the parables, the Sermon on the Mount, and other key passages. Ladd was professor of New Testament exegesis and theology at Fuller Theological Seminary, Pasadena, California. Customer Reviews For "The Gospel of the Kingdom"
I have been immensely blessed by this book. Ladd has done a great job expounding the truth about the Kingdom of God in the Bible. He is faithful to the text, and his explanations about the common understanding about a passage of Scripture and how to interpret Jesus' parables are invaluable and essential for every Christian to read. This book gets me excited about the future coming of the Kingdom of God and the second coming of Christ.